My clients know that I am a self-described country boy. Each day I commute in from Guadalupe County where we live on enough land to raise horses, cattle and pecans. I was raised in the country and this land is such a blessing to me, now more than ever. And as I mature (grow older! ), it becomes more and more the place for me to pray and relax and work and be refreshed. I want my wife and children to know the land. I want to work alongside them, seeing and being a part of the circle of life. I bring that belief and passion to my practice. Whether such sentiment is part of your philosophy or not, I’m honored to serve you. My office should feel like a retreat for you. We can slow down a little. Visit. Then build or rebuild your plan. Call us today. Photo credit: Michael Long; 2014. 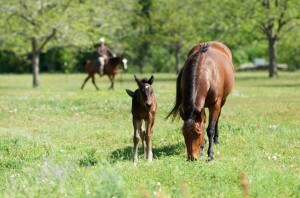 He captured this great shot of Josie, one of Matt’s American Quarter Horse mares, grazing with her foal, Smarty. And there’s Matt riding his Arabian mare, Arwen, in the background.